LNJ Denim is committed to processes and technologies that help keep our environment green and our business sustainable. Eucalyptus from sustainably managed plantations such as this one provide cellulose for lyocell, one of many fibres we can utilise in your denim. The Global Recycled Standard (GRS) addresses input material verification, chain of custody, environmental principles, social requirements, and labelling for textile products made from recycled materials. It aims to bea full-product standard for recycled material content that balances rigor and practicality for the industry and end consumers. 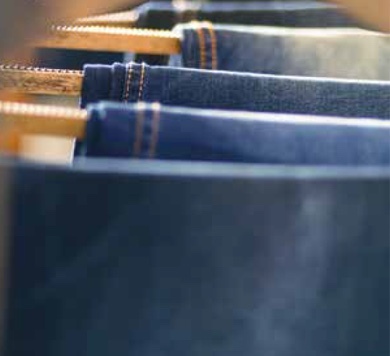 We proudly offer recycled denim products in both rigid and stretch constructions. Our state-of-the-art Garnett machines efficiently break down post-consumer waste fabrics and convert them into new usable fibres—we’re weaving new denim while eliminating excess waste from landfills. We also offer fabrics dyed with advanced techniques that use less water and fewer chemicals. To round out our efforts, we treat all of our post-process water in our own effluent treatment plant and further purify it via reverse osmosis before returning it to the environment cleaner than before.